As those who have read other articles in this blog will know, our horses live out 24 / 7 all year round. Our horses are also barefoot , all but one having transitioned from shod. Last winter both my mares went lame . I couldn’t find anything to cause the amount of lameness, but due to the way the horses were ‘guarding’ a particular foot, thought that maybe there was an abscess to blame. I didn’t ask a vet to visit, as I knew that they would want to dig away at the horses feet , causing more , and in my opinion, unnecessary damage , would probably want to put a poultice on and often prefer to have the horse on box rest . If you have had a horse with an abscess you will know how awful it is to watch your poor horses in such pain, yet all you can do it give some painkiller and wait for the abscess to find an exit route. This took 3 – 4 days on this occasion; then I noticed that the girls were moving easier, on inspection, I found that Hannah had an exit hole on her bulb, and Martha on her heel. The fields were muddy to say the least, and there really was no way to escape this and to keep the horses living out with the herd. The horses live out all year, and they most certainly would not now appreciate being kept stabled, they don’t even like going into the stable to be groomed and tacked up when the weather is very wet. Constantly moving around also helps circulation, hence recovery, and could help the puss from the abscess to be expelled. I didn’t believe it would be beneficial to apply a dressing for protection, the mud in the field would most likely pull the dressing off, and it would hold the wet against the foot anyway, not allowing for drying when the horses are standing out of the mud . I eventually decided to leave the whole thing to nature, surely she knew best !!!!! Worry! Worry! Worry! I gently cleaned the abscess exit area each day and applied an aerosol purple spray that had antifungal and antibacterial properties. The aerosol is better than the pump spray as it gets much deeper into wounds cracks etc. The ‘girls’ were not lame once the abscess had found an exit area, but each had some time off work due to the area of the exit holes. 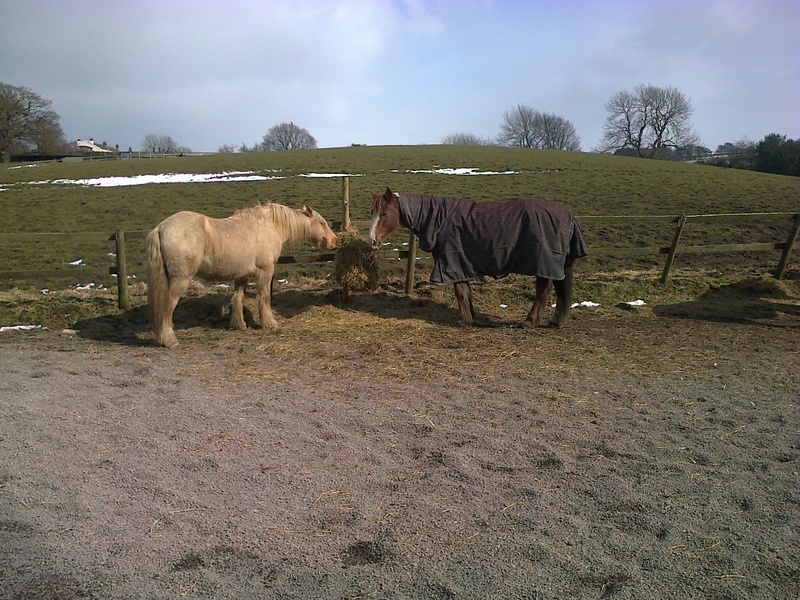 Even though the ground was very muddy in areas, both horses healed very quickly, with no sign of infection . So many things we do with our horses now are rather ‘experimental’ , we go a lot on our ‘gut instinct’ , and learn from our horses more and more. One of the things the horses have shown us is that the best place for a horse is outside. Several years ago, whilst still on a livery yard, one of our horses almost died due to a breathing problem, another could not be ridden for the same reason. Both these horses have lived out for several years now, on no medication, they have been back in work for years, and have had no problems whatever with their breathing . I find it most frustrating when horse owners tell you about their horses breathing problems , that they are on ventipulmin ( as one of ours was ) they can’t be ridden, have to soak their hay etc; yet they will not put their horses on total turn out; apparently they believe their horses couldn’t cope being out all year!!!! Really ? But they can be put to death far too soon instead ? Having constant turnout keeps the horses fitter and stronger, being kept as a constant herd keeps them calmer and the herd hierarchies ensures minimum injuries due to a stable pecking order. when our horses have had tendon or muscle strain injuries, we have given appropriate pain relief and left them turned out. The horses regulate their movement according to what they are able to do, and the other horses seem to be aware that there is a problem and are more than usually tolerant. The horses definitely heal quicker than those horses put on box rest, and because they are constantly moving around any scar tissue is kept to the minimum. The horses return to fitness quicker and are less stressed . So to summarize, the best way forward for our horses seems to be keeping it simple and allowing enough TIME for healing . Time appears to be one of the things that so often seems to be in short supply . Since writing the above we have completely stoned our ‘yard area’ , we allow the horses free access to this stoned area from which ever field they are in, we also hay them in this area, allowing the horses dry standing for a portion of the day, whatever the weather. Doing this had definitely helped the condition of the horses hooves during the wet muddy winter, and has also helped to keep the fields in much better order, thus prolonging the grazing, and preventing poaching. The stone we have used is small, and the horses love to stretch out and roll on it . We have also found poop picking on the yard is so easy, as we can use the shaving forks, knew it was a good idea to hold onto them. A great success all round. Each year we find ways to improve our horses lives and make yard maintenance a little easier for us humans ! !